Description: (Obverse) a cross flory terminating with a rose, surmounted by another cross made of propeller blades charged in the centre with a roundel within a laurel wreath. The horizontal arms bear wings and a crowned RAF monogram at the centre; (Reverse) the royal cypher GRI, George VI, above the date 1918. The cross is suspended from a bar decorated with a sprig of laurel. Ribbon: Diagonal alternate stripes of white and deep purple. Comments: Established for officers and warrant officers of the RAF in respect of acts of valour while flying in active operations against the enemy. The DFC is issued unnamed but Second World War crosses usually have the year of issue engraved on the reverse. 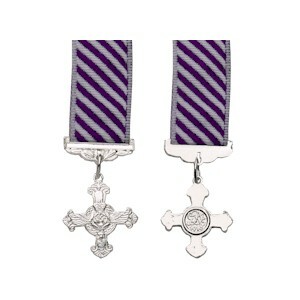 After the 1993 review of gallantry awards it was decided that this medal could be awarded to both officers and other ranks; the Distinguished Flying Medal having been discontinued.